A combination of mid to high water tables and freeze/thaw cycles will cause hydraulic pressure on your basement slab and/or foundation walls. Drain tile can be installed to relieve this pressure and divert water to other locations. Drain tile typically runs the perimeter of your house and terminates at a pit inside at the low spot of your basement. A pump rests at the bottom of this pit and ejects the water collected when it has filled to a certain point. The ejected water is connected to a hose that discharges the water up to 50 feet away from the house/foundation. When installed decades ago, typical drain tile systems encircled the perimeter of the house and tied into a murphy-pit or floor drain. These fixtures were then connected to the sanitary sewer for discharge. 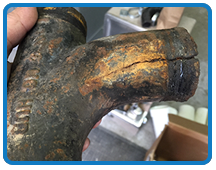 Connections such as these are now illegal because in times of heavy rains/thaws, the public sanitary system becomes overloaded, resulting in flooding and treatment plant/lagoon failures. Many municipalities are mandating storm sewer/sanitary sewer separation to prevent these events from happening. If your basement is subject to storm water leaking, seeping, or flooding; a drainage system is your solution. 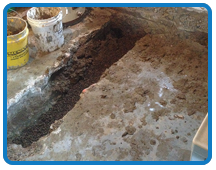 We can open trench along the entire exterior of the house and install drainboard on the outside of your foundation. When water meets the drain board, it is channeled to new drain tile at the bottom of the trench. 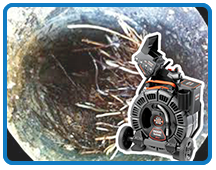 The drain tile transfers the water to a sump pit, which pumps it through a discharge hose up to 50 feet away from your house – keeping everything dry. If exterior disruption is not an option, we can install a French drain. A French drain requires jackhammering of the perimeter of your basement floor. A small trench is excavated and drain tile can be installed at the same level as the foundation. As water finds its way around the foundation, it will now percolate into the drain tile instead of leaking/seeping through walls and floors. The drain tile is connected to pit that has a pump in the bottom of it. Once filled, the pit will eject water up to 50 feet away from your house.